In February 2010, the last year our family was living in Los Angeles, I had to take my kids to an orthodontist in the Larchmont district of Los Angeles, located north of Hancock Park, and south of Hollywood. What impressed me - to the point of going back to my car to get my camera - was the view out the windows. Wow! 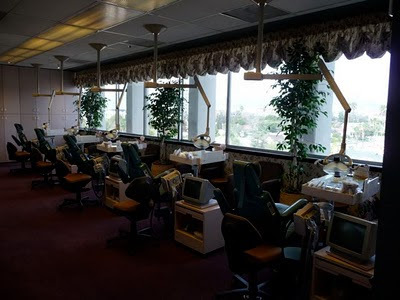 These photos were all taken from the orthodontist's 5th floor office at 321 Larchmont Blvd, just north of Beverly Blvd. I liked the above photo so much, I ended using it as the backround for this blog. 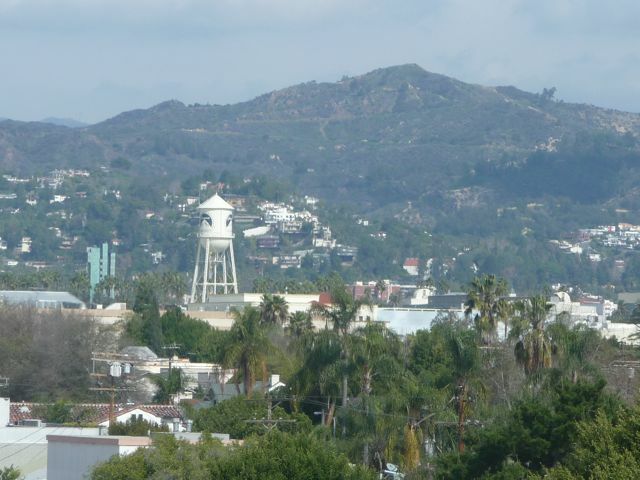 Looking to the right (east) is Paramount Studios located on Melrose Avenue, about a mile away. 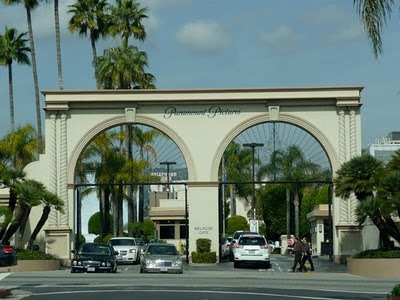 Paramount is the only major studio actually located in Hollywood. Universal, Disney, and Warner Brothers are located "over the hill" in the San Fernando Valley. 20th Century Fox is located in Century City (just west of Beverly Hills) and Sony Studios in Culver City. They comprise what is known as "the big six" major film studios. And their influence is global. 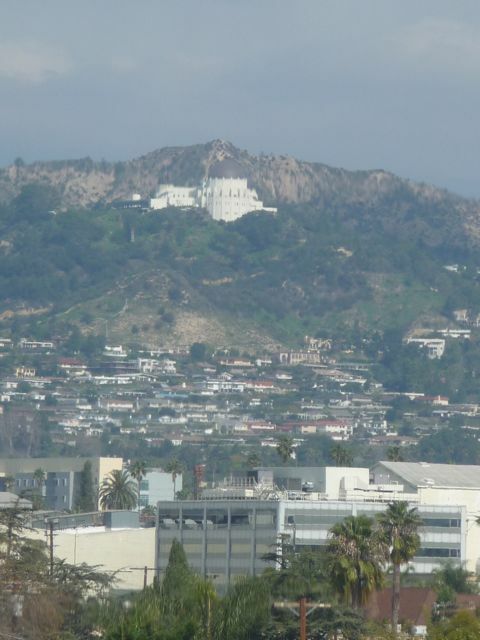 Further to the right (east), the Griffith Observatory, what's been affectionately referred to as the "hood ornament" of Los Angeles. 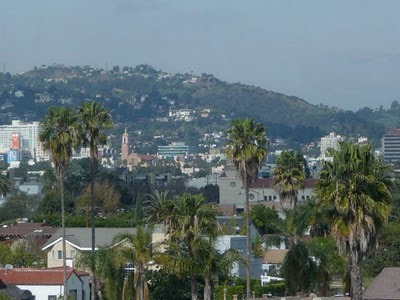 To the left (west) are the Hollywood Hills and - rising out of a sea of one story bungalows - the 80 year old "El Royale" apartment building, located at 450 N. Rossmore Ave.
Long a celebrity magnet, the El Royale has been home to Loretta Young and Clark Gable and, more recently, Nicolas Cage, Uma Thurman and Ben Stiller. Units in the building range from 950-square-foot one-bedrooms that start at $2,000 per month, to the 3,000-square-foot, two story penthouses that rent for $4,000 a month. There are also two- and three-bedroom apartments and one-story penthouses. Looking left (west) towards the heart of Hollywood. By way of perspective, the tower a mile and a half in the distance just left of center is the Blessed Sacrament Catholic Church, located on Sunset Blvd next to the historic "Crossroads of the World." 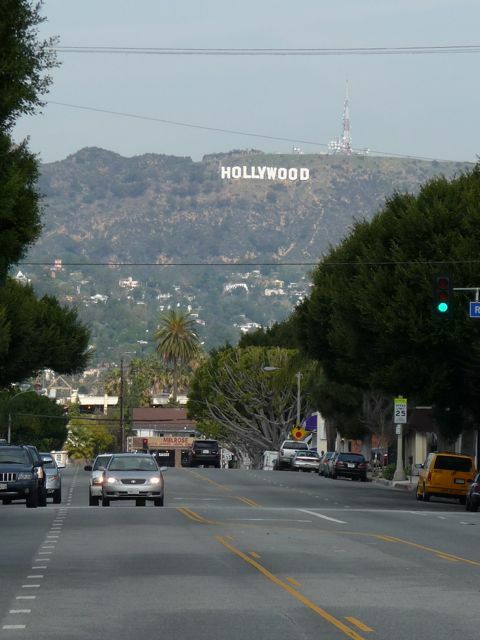 Four blocks further is the intersection of Hollywood Blvd. and Highland Avenue. Pulling back a bit from the windows you can see that, yes, this really is an orthodontist's office. 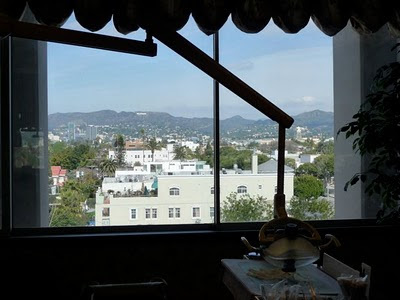 Nice view of the Hollywood Sign while getting your teeth worked on. For some reason, we were the only people there at the time. I assume it gets busier later in the day? 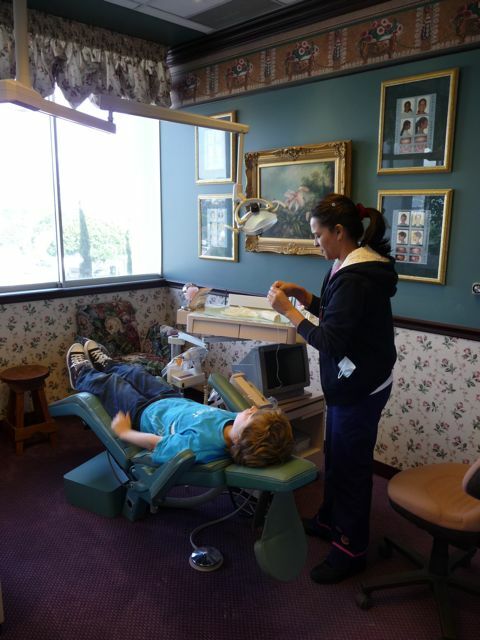 My kids got x-rays and my son had his retainer adjusted. Ah, the joys of being a kid. But I guess adults get braces too ... forgot to ask if anyone "famous" ever comes in. You know, "orthodontist to the stars"? Hmm, maybe ... but maybe not. Afterwards, we drove up Larchmont Blvd. for lunch. 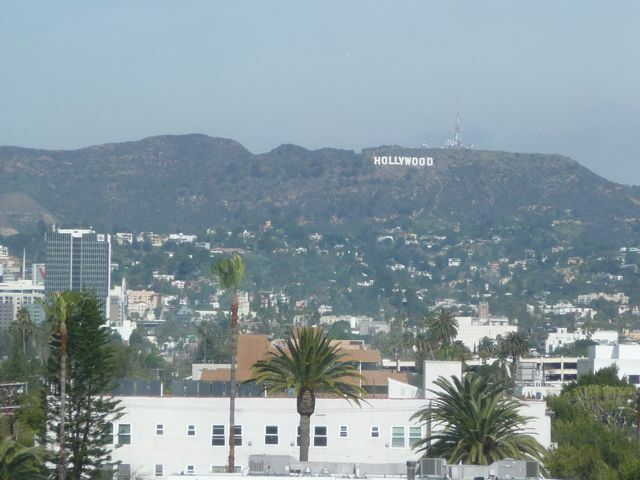 Hollywood sign in the distance. 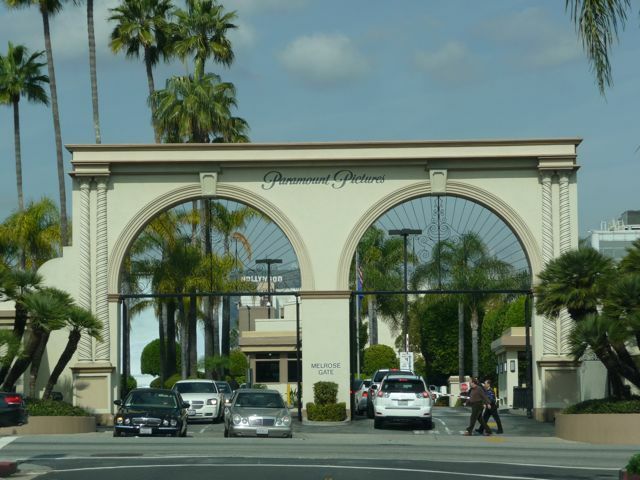 We passed by Paramount Studios and stopped for a quick photo. You'll notice the Hollywood sign, visible just above the guard house. I thought about taking my kids to "Pink's" hotdog stand in Hollywood, but driving by decided it wasn't very kid friendly. 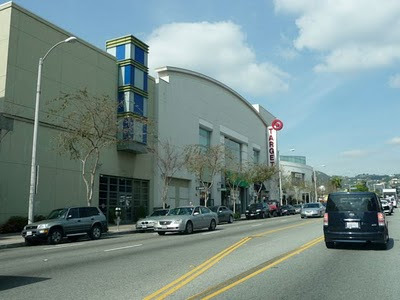 We ended up at a McDonald's about a block from this Target (this is what a Target looks like in Hollywood). Thinking about the impressive views of Hollywood, I'm reminded of a friend from church - a very committed Christian - who moved to Los Angeles with his wife and kids several years ago to work in the entertainment industry. I wish I could say everything's been awesome career-wise in terms of breaking into "the industry." It's actually been a pretty tough road. He's very talented, but aside from some small things, nothing's really opened up for him. His advice for anyone thinking trying to work in the entertainment industry without a plan? "Don't come." That doesn't mean "don't come" - it means "don't come without a plan." Actually, I think of all people, Christians should have a plan of how best to use their gifts, abilities, passions, and talents to glorify God. Whether behind a camera, a desk, a surgical mask, a counter, or broom. Meanwhile, it's my hope that more Christians choose to live in Los Angeles. Why? Because it's arguably the most influential city in the world. With a plan. Gotta have a plan. And even then, at least in terms of jobs, there are no guarantees. By the way, these pictures were taken mid-February. So I guess one guarantee in L.A. is the weather. No complaints. 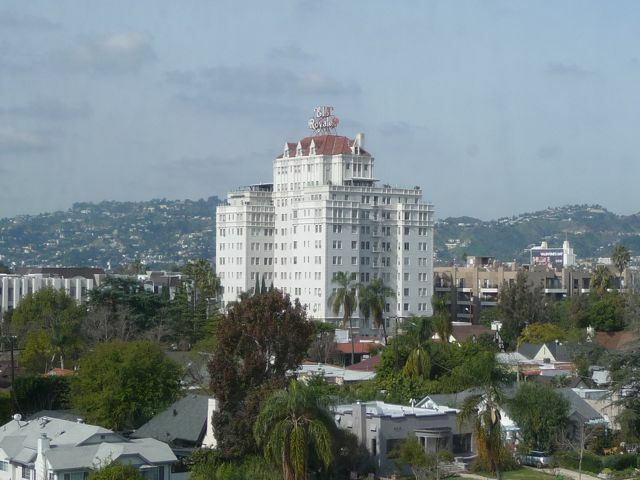 More information on the Larchmont district of Los Angeles can be found here. Thank you for re-posting these photos. 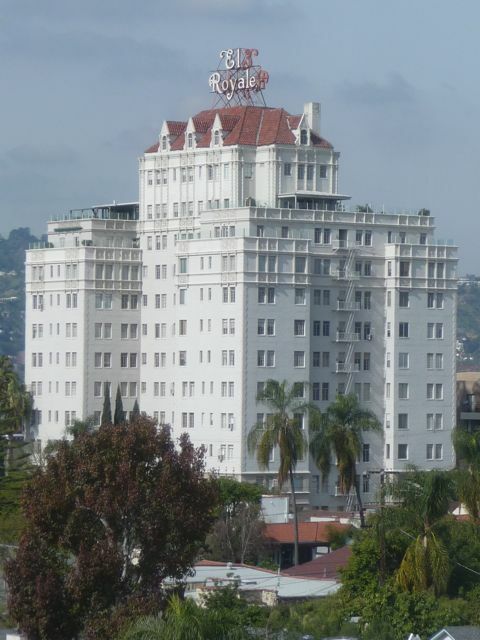 The El Royale looks like Disney's "Tower of Terror" - esp the version at the Disney Studios (Walt Disney World, Florida).